Did you know that to make ricotta at home you only need four ingredients? The key kitchen gadget you will need is a thermometer. Now, don’t be put off by the word thermometer. There is a general feeling amongst people I come across who think that when a recipe requires a thermometer it must be complicated. If you are looking at a 25 process patisserie dish that requires a thermometer then sure, It probably will be complicated. But thinking logically, how complicated can a 4 ingredient recipe be my friends? Not very. If you have ever wanted to experiment with making your own cheese, Ricotta is the perfect one to try. It will surprise you how quickly it takes to go from starting the dish to sitting down to a slice of bread topped with ricotta and drizzled with honey. Ricotta is technically not a cheese as it is actually a creamy curd which has been cooked twice (hence the name “ri-cotta” meaning “re cooked”). Ricotta was developed by extremely resourceful Sicilian farmers wanting to get as much out of the by-product of their cheesemaking process by recooking the left over whey. It is wonderfully light and creamy and has a multitude of uses (in pasta fillings, sauces, toppings, pies, cakes, cannoli – the list goes on). If you have a little bit of spare time on the weekend why not whip yourself up a batch of homemade ricotta? You will be proud of yourself when you sit down to eat the results, and will probably find yourself making it over and over again… like me! Place milk, cream and salt in a large heavy saucepan stir to combine and then insert thermometer. Place saucepan on medium heat and allow milk to heat up slowly, stirring ocassionally so the bottom doesn’t scorch, until it reaches 85 degrees Celsius. Once it has reached 85 degrees, remove from heat and add the white vinegar to the pot stirring only once or twice to distrubute evenly (you will notice curds start to form straight away). Leave the pot untouched for 15 to 20 minutes for the curds to develop (the curds rise to the top and form ricotta and the remaining liquid is the whey). Place a piece of cheesecloth inside a colander and place this on top of a larger bowl. Transfer the curds from the pot to the colander with a slotted spoon. Set aside the bowl and colander for 15 minutes allowing the whey to drain from the ricotta. Pick up the cheescloth containing ricotta gently from the four corners. Twist the top and press down on the cheesecloth very gently in the colander squeezing out some of the remaining clear whey (if the liquid runs milky, stop squeezing). Open the cheesecloth and there you have your Ricotta to use as you see fit. I like to use Ricotta quite simply on toasted Italian bread topped with either savoury or sweet items – see below for my simple serving suggestions! Scotty and I often have savoury ricotta on toast as a Saturday or Sunday morning quick and easy breakfast. Top a toasted hand cut slice of Italian pane di casa bread with a couple of tablespoons full of ricotta. Top that with slices of avocado and tomato and drizzle with extra virgin olive oil. Finish off with salt and pepper and a few basil leaves. The creaminess of ricotta lends itself to being paired with some wonderful sweet items. For those who love berries, slice 5-6 strawberries and place in a bowl with a tablespoon of icing sugar and a healthy squeeze of lemon stirring well till syrupy. Top a slice of toasted Italian bread with a couple of tablespoons full of ricotta and a drizzle of honey. Add strawberries and syrup to the top and serve. For lovers of bananas, slice one banana and place on a baking tray with a sprinkle of caster sugar on top. Pop under the grill until golden and caramelised. Top a toasted hand cut slice of Italian pane di casa bread with a couple of tablespoons full of ricotta and a drizzle of honey. Top that with slices of caramelised banana slices and serve. You know what? You've convinced me. I'm going to give this a crack. Well there you go. I never knew ricotta translated to re-cooked. Learn something new, hey? Looks so creamy! I love that your recent post is a recipe with Ricotta too! I've always wanted to make homemade ricotta but have yet to do it. Something so easy and I am sure, so delicious! I need to get on it! Wow, only four ingredients, genius! Yours looks amazing, savoury and sweet. Love that cute spoon you have too! I did a cheese making class last year. I was in charge of making the ricotta from the left over whey. I ended up with 2T of the stuff. I will admit it was the amusing part of the class. Much prefer your method! I agree that making your own ricotta is both pretty easy, and worth every bit of trouble. I get fresh milk from one of our neighboring farms and it is so incredible. Love your photos! I love that you make your own ricotta. I used to get great fresh ricotta when I lived in NY, but haven't found anything nearly as good since I moved to TX. I think your post may be a sign that I should start making it at home now! Most big grocery stores have it. I've even seen it at the dollar store! Can you then make ricotta with THAT leftover whey? How long does the ricotta keep in the fridge? I loved your pictures….these are classy with that nice spoon! 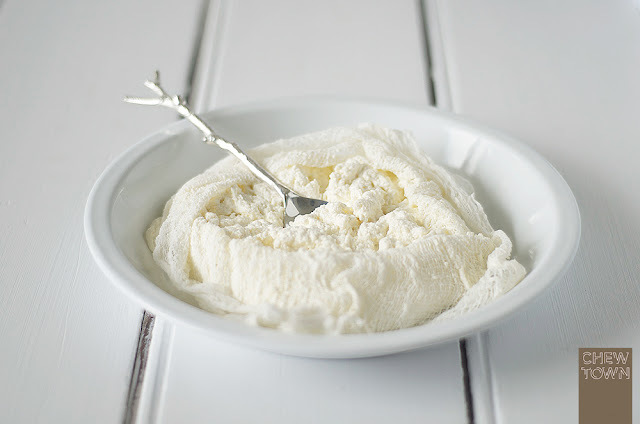 Ricotta cheese is so easy to make, thanks for the recipe! I've never made my own ricotta! Silly, because I know how easy it is. But the fact is, I've just never taken the trouble. Definitely something I plan to try, I hope later this year. Love your "twig" utensils! I love making ricotta! Haven't done it in a while but you have inspired me! Looks beautiful! Ali is right, I think I got mine from woolworths. Smaller kitchen places also have it. Hi Ali, It is all about the protein I believe. Most of the milk protein (including casein) is removed when cheese is made, but some protein remains in the whey (mainly albumin) which is why you can then make ricotta. The whey left over from the Ricotta process then doesn't have enough protein remaining to do through another cheese making process. Hi Brittany, about 2-3 days. Ok, my mouth is watering. I really need to try and make my own ricotta, I have not tried to do it yet. Thank you so much for this gorgeous tutorial Amanda! You make it look so easy! Thank you for this simple receipe, I would like to give it a try, but I wonder what type of cream do you use? Thank you! This ricotta would be amazing with fresh milk! Thanks John, I got them at West Elm and had them sent to Australia. Worth the extra freight costs I think! Hi Beah, I used pouring cream for this recipe. Can you tell me if this can be made using almond milk? We now have west Elm Furniture shop in Perth, Western Australia , can buy cutlery there? This isn’t ricotta; it’s not cooked twice as you describe ricotta to be, or made from whey! Why don’t you just call it cottage cheese, which is what it is…?